And that you check out the page on Protection Magic, since you want to sweeten them and have a peaceful home, but you also want to protect yourself and your homespace. Thanks so much Bri; I checked out those pages. They are very helpful- but me and my husband live in an apartment and my mom owns a house, we go to visit often- Do you think the Peaceful home products will still have an effect even though we all don't live together? -As for the Honey jar- could I possibly make 1 for all three of us for harmony - how would I write our names on the paper? Should they all overlap each other? I think that Peaceful Home products would definitely benefit you! You could also get Peaceful Home sachet powder and deploy that in your mother's home sneakily too and influence her homespeace in that way. You can definitely put the three of you in the same Peaceful Home honey jar. If you can get personal concerns from each party that would be best, just put all of them in the same honey jar. The petition paper could be written with each of your names written one time or three times each and then encircled by a straightforward wish like "love each other get along." You might write the names for family-members in list-format, with your name between the other two, as the link that brings them together. he encircling petition suggested by Bri would work with either and is very succinct and strong. You can also write the names in different colored ink or in such a way so that one person's will is more powerful and more influential than anyone else's. You are trying to restore peace in your home because your mother and husband bicker, so you might want to write their names one way and your name written over their names and then the whole thing encircled. If you wrote their names in black or pencil and your name in red it would give the petition extra oomph. But again, this is only if you are comfortable taking the lead in the situation and being the one who has the most influence. If you want a more equal relationship with all three people then go with the triangle. So if I were to write their names together, would I write my husbands name 3 times, then my mothers name three times under his so it would look like 6 names one directly under the other and then my name crossed three times over theirs? I would do your name written 7 or 9 times over your husband and mother's name. The idea being more repetitions=more power and influence over the situation and the people involved. Thanks again Bri. Just one more question.-Does moon corresondence have a big effect when I make the honey jar? Should I wait until the moon is waxing? Timing is not as emphasized in conjure as it is in other forms of magic, most people will do the work that needs to be done when it needs to be done. If the moon phase accords then that is wonderful, if not, they will do the work anyway. There are always exceptions and there are always spells where the moon phase seems more or less important, but typically we do work when we need to. When we do look at timing we often start with smaller increments than the moon phases. You can go ahead and do the work when the moon is waning, but choose the day/time of day you do the work so that you are brining things to do you. For instance, many work on the principle that when both hands of the clock are up is a good time to draw things to you, when both hands of the clock are down, it is a good time to get rid of things. Sunday is a good day for blessing, Wednesday is a good day for improving communication. I have put together a honey jar spell, wiped down the candle with urine, and then rubbed rosemary oil on it. I know that I have to do this every day...but do I have to do the thing with the paper where i write down the names and what i want each day as well? Whoa. You "know" that you have to rub the candle with Rosemary oil and urine every day? Who told you that? 1) I have never rubbed a candle with urine in my life and would never tell anyone to do so. 2) It is most common to burn a candle on a honey jar three times a week, not daily. We generally burn candles for sweet spells on Monday, Wednesday, and Friday. Why those days? Because many of us avoid doing sweet work on Tuesday (war day) and Saturday (enemy work day) -- and on Sunday folks tend to go to church. 3) The petition paper is put inside the jar once. You do not need to open the jar and add more papers again. Please read the Honey Jars page in "Hoodoo in Theory and Practice". the urine was to clean the candle. And rosemary oil was the dressing oil I used for annointing the candle. I apologize for the confusion. And thank you that is good to know. A friend whom i have been talking to recently said that she is at wits end as to how to reconcile her new hubby with her teenage daughter. they are both great people but put them together and its the mother of all world wars. I was thinking a honey jar would be good for the situation, but what should she put? What do you think? Would this work? What else should she be adding? That sounds like a good plan right there. 1-I just received my Peaceful Home Honey Jar from LM. What is the correct way to do a name paper with multiple names? I want to include all my family members. 2-Also, should I include photos of all? 3-Also, should I include personal items of all family members inside jar? #1) Include all the names on the petition paper - write all their names down, and cover them with your petition. I was working a peaceful home on us but when I started the jar I wrote in my petition that I wanted us to always remane friends because that's all we were when I made it. I have been burning blue, pink and white candles I use whichever colors I have at the time. He has been upset with me for a few weeks and I guess he just couldn't handle it anymore. The whole fight happened after I used a black and red candle incorrectly, I have done uncrossing bath since then and cleaned his house with healing bath. What do I do now I've had a reading two months ago and I don't have the money for one now. Do I still work our honey jar? I still want to be with him in a relationship... But I do feel like he may need sometime to get over the fight that led us here... Since I've done all this work on him does that mean he'll come back? Sorry to be blunt, but why are you doing all of this work? If you don't have the supplies and you don't focus your intention properly, you're not going to have a good chance at manifesting what you want, so you've wasted time, wasted supplies, and wasted the energy you could have used to do something the right way in the first place. I know you said you used what you had on hand, but it's very easy to get plain candles locally. Stock up on white and black. Next time you need a substitute, there you go. Next time, before you do anything, remember that if you don't plan for success, you have essentially planned for failure. Always, plan and focus. Lay out your tools, supplies, etc., read over what you have to do, and make sure you know what you are doing before you jump in. You mIssed read my post psychic Mimi... I said I don't have the money for a reading right now, I have all of the supplies I need however I can use different color candles for different intents. As far as me doing the black and red candle wrong I did it the way someone told me to do it in my inbox but when I posted what I did Miss Cat explain that wasn't what those candles were intended for. believingforthebest wrote: I have been burning blue, pink and white candles I use whichever colors I have at the time. When you said that, I understood it to mean you had petition X going, but used whatever candle color was available regardless of the correspondence. Sorry if I mistook that statement. Be that as it may... I did see that you said you didn't have money for a reading right now, but I wouldn't have mentioned to go get one just yet. Given all the work you said you've done, it might be too soon. I'm assuming, so feel free to correct me if I'm wrong, but if you only began your work 2 months ago or less, you still have a window of at least one month to see your work manifest. Maybe even two, again, depending on how recently you began. My advice is to wait it out for now. If I understood the rest of your post, you've petitioned for friendship first then love, so this friendship may very well be the answer to your first petition. If it were me, I'd hold off on anything other than tending to the honey jar appropriately and perhaps submitting a prayer request to the Crystal Silence League. Be there as a friend because you value that friendship and it seems like you would still want at least that. So be a friend. After the emotional rollercoaster of the recent split has run its course and you have given your work time to manifest, then you will be in a better place to objectively look at the situation and decide what you want to do. In the meantime, accept the friendship you have petitioned for, and don't push anything on him right now. You want him to be sweet on you, you want him to be comfortable with you, and in doing these things, you may very well see some sparks fly. Save up a few dollars every week while you give your work time to manifest. By the time you have saved up enough, you can decide if you want to proceed with a reading on this issue, or perhaps just go out and buy new shoes instead because you have what you wanted (or simply moved on to something better)! Thank you Psychic Mimi... that helped to know that maybe I was jumping the gun, I've been working the honey jar for maybe a year now but everything else I've only been doing for a few weeks so it hasn't even been a month... lol Ok I guess I should just sit back give him sometime and wait to see my work work out . Plus before we broke up I had serval signs hat my work was going to work, I heard his name three times on tv within two or three days and out of all the yrs we've been together I never heard him name on tv. Re: We broke up - can I still work Peaceful Home honey jar? 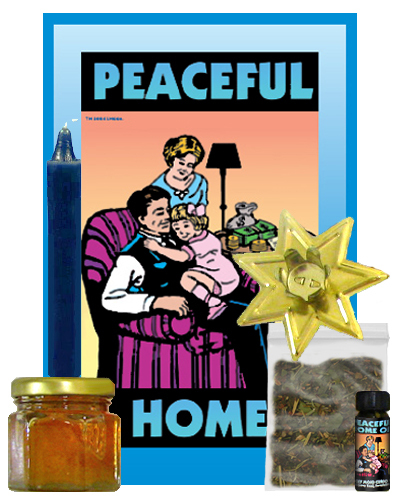 Here is the Honey Jar kit for a peaceful home and family, to calm down everyone in the family, including those who live together and also visiting in-laws and relatives when they come to the house. I purchased the Peaceful Home Honey Jar kit this weekend and I have a few questions. I want to increase the peace in my home between myself, my two son's, and my friend/lover. After reading the instructions, I think I understand how to do it. However, I do not want my friend/lover to be sweet on me, just more peace in my home between us all. Would I add all of our names crossing over one another? And if so, is there any order they should be written? Meaning, who first, who on the top? Would I add hair or finger clippings (whatever I can get) from all of us? I believe I should write in the circle surrounding us, "Peaceful, Calm, and Loving Home." I am going back to Lucky Mojo this weekend to purchase the Honey Jar book but I figured I would give this forum a go. Thank you ahead of time, I appreciate you reading my post. Would I add all of our names crossing over one another? And if so, is there any order they should be written? Meaning, who first, who on the top?- No, write all their names and cross them with "Peaceful Home"
I have one more question, then I am ready to bring this peace to my home. I did purchase and read the Honey Jar book (glad I did). However, my only question would be, is there a specific day that I should begin my honey jar? The book mentions Monday, Wednesday, and Fridays but that is for love. I would like to start today (as is it is getting worse and the tightness in my home is hurting more) I know any day is a good day to begin but if a certain day would be more powerful, I will wait until that day. As always, thank you so very much for your time. If you want to start it today I say go for it! Sunday is a great day for any kind of positive peaceful type work. Go for it! I am currently in a difficult situation. My brother and my sister n law along with their 4 small children (ages 1, 3, 8, and 10) moved in with me, my son, my sister, and my mom over a year ago. It was supposed to be a 3 month arrangement but as you can see, it didn't turn out that way. My brother and his wife constantly fight and it is usually physical and they always have this habit of fighting right in front of their kids . My brother has these explosive tendencies where he becomes downright scary and he is physically abusive to his wife and their children especially his wife's 2 daughters. Then out of nowhere he becomes so sweet, you almost forget that he has mental issues. His wife has been diagnosed with OCD (doesn't take her meds) and she doesn't make the situation better. She will not let my brother have any friends, she stays paranoid about him going to work, she got him fired from his last job because he didn't answer his phone, while he was there, and confronted his boss and accused her of sleeping with her husband. When things are surprisingly calm in the house, then the children start acting up. Their three year old son is extremely belligerent, doesn't listen and becomes destructive (breaks things) when he doesn't get his way . His daycare is threatening to expel him as they say he is a safety hazard. Their 8 year old daughter lies all the time and I think she suffers from ADHD as she is constantly flipping and running around the house 24/7. The 10 year old constantly starts fights with her. The only sane one in that bunch is their 1 year old. Together they are the most explosive family I have ever laid eyes on. But I sometimes wonder if they feed off of it because after they've caused each other a significant amount of damage, they're absolutely fine in the aftermath and smiling as if nothing happened. The problem is being in the middle of that madness. My mother has attempted to put them out but she is afraid of what will happen if they are left to their own devices. I cannot continue to have my 8 year old son exposed to this. I am trying to find us a place to live but money is difficult to save at the moment. In the meantime, I bought a Peaceful Home Spell Kit to try to calm what's in my home until my son and I can find a new one. The problem is the spell is for married couples. I am not married but I do live with those folks. I am not sure of an alternative way to bring peace to my home. Thankfully my brother is seeking psychiatric help as he is aware he has a problem. But I need to strengthen his cause because I don't know how long that will last and the fights haven't stopped. Can you help me learn how to use this spell in a way that it will benefit all of us? Thank you so much for your input and God Bless you in advance for your help. I am so sorry to hear you are going through all of this! What a full house, and your brother's mental state is only making it worse. I really feel for you. You can still work the Peaceful Home Spell Kit for your family. Just be sure to word your petition accordingly, and use the names of everyone living under your roof. It should still help you. You could also put everyone into a honey jar, to strengthen your bonds and keep your relationships sweet. It will take time to work but it is a very powerful spell. For your brother, please consider Healing and Tranquility products. It's good that he recognizes his issues and is getting help. You can add a few drops of those oils into his shampoo bottle, or dissolve bath crystals in those formulas and do likewise. Even though these both smell absolutely heavenly, just use a little bit so it doesn't become noticeable to him. Also, you can consider working with Dr Jose Gregorio Hernandez to help ensure your brother is finding mental health practitioners who can truly help him. I wish you the best, and hope you will keep us posted. Good luck! Thank you SOOOOO very much for this. I did not think about washing my brother's clothes with the bath crystals or putting stuff in his shampoo to relax him. That's excellent. I'm gonna share this with my mother and we'll get to work on this today. I will let you know how things turn out. Bath crystals in the laundry rinse cycle is one of my absolute favorite ways of working, and it produces results consistently for me. I hope you have the same luck! Im thinking of starting a honey jar on my daughters grandmother and grandfather. (Baby daddy's parents) i really want us to have a better relationship cause we have been fighting a lot especially me and the grandmother. So for the sake of my daughter i want to sweeten them up and start over. So my question is when writing a petition do i write both their names 9 times or i write the other ones 4 times the other 5 times then put my name over their names 5times. Also i do not have any personal concerns of them except birthdate maybe and a picture. Lastly what sort of herbs do i use on this kind of situation, and which prayer do i recite. Lastly is it practical to work on breakup work while im working on this kind of jar as well? Because my baby daddy is seeing someone else so was thinking of starting breakup work but i dont know if it will affect the honey jars. 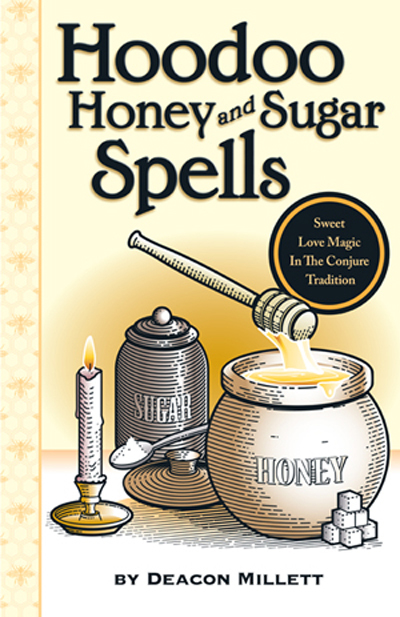 I moved your post from the thread about Reconciliation honey jars over to this thread about Lucky Mojo's Peaceful Home honey jar spell kit, because that is the type of work that seems best suited to the situation you're describing. If you scroll up to the beginning of this thread then read all the way through (especially posts from moderators, whose names are in green text, and Miss Cat, whose name is in red text), you can start to read about how this kit works. I recommend the kit to you because it comes with everything you need to do the spell (including herbs) as well as complete instructions so you can cut out any guesswork. If you choose to do Break Up work at this time, you are free to do that. That work will not impact your honey jars. I am thinking of purchasing the peaceful home honey jar kit and also have a peaceful home vigil lit for me at the missionary independent church. However i am a bit confused if its the right choice as me and my baby's grandparents do not leave in the same house. And are not in talking terms at the moment due to a fight we had last week sunday. Will this be ideal for our situation or its for those who live in the same house. Also will it be ok if i have the peaceful vigil and reconciliation vigil lit same time at the mic just so we can reconcile and start plover in peace. I apologize for not reading your post more carefully. If any of these people are coming into your home, you could utilize Peaceful Home products by, say, dressing the doorknob lightly with the oil, or hiding some sachet powders where your targets will walk over them. But for the honey jar, I think you were on the right track with the Reconciliation route. Reconciliation products are typically used to reconcile lovers, however, people have had success with using it to reconcile people who aren't involved romantically. So, I think a honey jar or sweetening jar with candles burned on top dressed with Reconciliation oil would be a good idea, and for extra healing power you could use Healing oil as well. Put name papers for all your targets into the same jar, and make sure to add Balm of Gilead buds to soothe any raw feelings between you all. And I think the Reconciliation and Peaceful Home vigils are a great idea. Good luck to you in your work. My boyfriend and I have a great relationship, his parents love me to. The problem is his parents are both narcissistic. Everyone thinks they are great wonderful parents. Nobody sees the truth. My boyfriend has been physically and emotionally abused by them all his life. My bf is 19. He hates his parents, and as soon as he can afford to move out, he plans on never having anything to do with them again. The problem is until then he is at their mercy. They have a rental house that they told their son he can rent from them in august, now the jerks have told him he can't rent it until he saves up 6000.00 dollars. And bf is going along with it. This btw is the third time they have manipulated him out of the house. I am at white end. I was thinking of a honey jar to use on them to make them sweet toward their son and just leave him alone. Does any body have any ideas on what to do, I'm not opposed to more harsher hoodoo. A honey jar is a great start! !